Lavora Barnes is the first African-American woman to be elected chair of the Michigan Democratic Party. Today on Stateside, what you need to know about the thousands of white-collar GM workers losing their jobs today. Plus, a recent study finds that firearms are the second leading cause of death among children and teens in the United States, killing eight young people every day. Thousands of salaried General Motors workers began losing their jobs today as part of a major restructuring at the company, which includes a 15 percent reduction in white-collar jobs and the closure of five North American plants. Daniel Howes is business columnist for The Detroit News. He breaks down just how many workers are being laid off, how long the process will take, and the fiscal reasoning behind General Motors’ decision. The New England Patriots' victory against the Los Angeles Rams on Super Bowl Sunday marked the team’s — and their world-famous quarterback Tom Brady’s — sixth Super Bowl win. John U. Bacon is Michigan Radio’s sports commentator. He joined us to talk about Brady’s beginnings on the University of Michigan’s football team, and to share his thoughts on the latest in college basketball. The Yankee Air Museum in Belleville is searching for any crew members who served aboard a B-24 heavy bomber called “Michigan” during World War II. Ray Hunter is the chairman of the museum. He tells us about Michigan’s “nose art,” which featured the UM Big House and a pinup girl wearing a garrison cap, and about the bomber’s ultimate fate following the end of the war. If you have any leads on crew members of the B-24 Flying Fortress named Michigan, you can reach out to the Yankee Air Museum. For African-Americans traveling South during the Jim Crow era, restaurant options were slim to none. Instead, families packed “shoebox lunches” to get them through their journey. Patrick Coleman is the owner of Beans and Cornbread, a soul food restaurant in Southfield that is offering their version of the shoebox lunch throughout February in honor of Black History Month. Coleman tells us about the history of the boxes, and how his own family's travel stories inspired him to sell them at his restaurant. 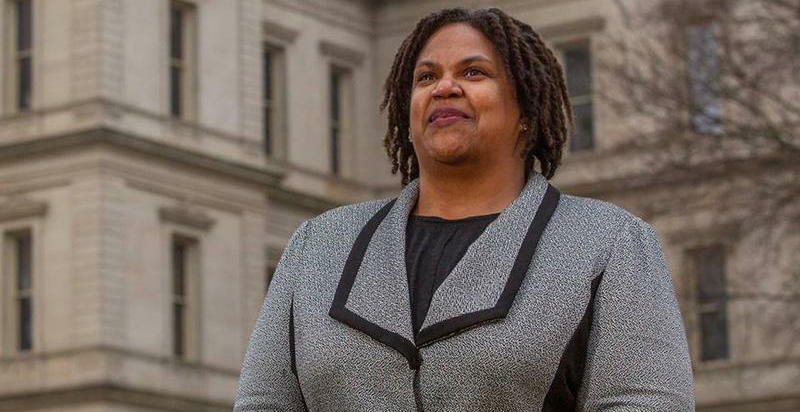 Michigan Democrats held their convention over the weekend and came away with a new state party leader: Lavora Barnes. She formerly served as the Michigan Democratic Party’s chief operating officer, and is the first African-American woman to be elected chair. Adrian Hemond is a Democratic strategist and CEO of the Grassroots Midwest bipartisan consulting firm. He tells us more about Barnes, her mission heading into the 2020 election, and why he thinks Michigan Democrats chose her to represent them. Eight children and teens die by firearms everyday in the United States. That's according to a recently-published study examining the leading causes of child and teen death in the country. On Wednesday, the U.S. House will hold its first hearing on the topic of gun violence prevention since 2011. Rebecca Cunningham directs the University of Michigan Injury Prevention Center, and co-authored the study. She breaks down the study’s findings, explains where the data came from, and tells us what she’ll be watching for from lawmakers in Washington.